This image taken by NASA’s Juno spacecraft is one of the first to be taken by the probe since it entered Jupiter’s orbit last week. It’s not the most spectacular image we’ve seen of Jupiter and its moons, but it’s a positive sign that the spacecraft’s visible light camera, the JunoCam, is operational and capable of transmitting data. The instrument was switched on six days after Juno fired its main engine and slipped into orbit around the gas giant. 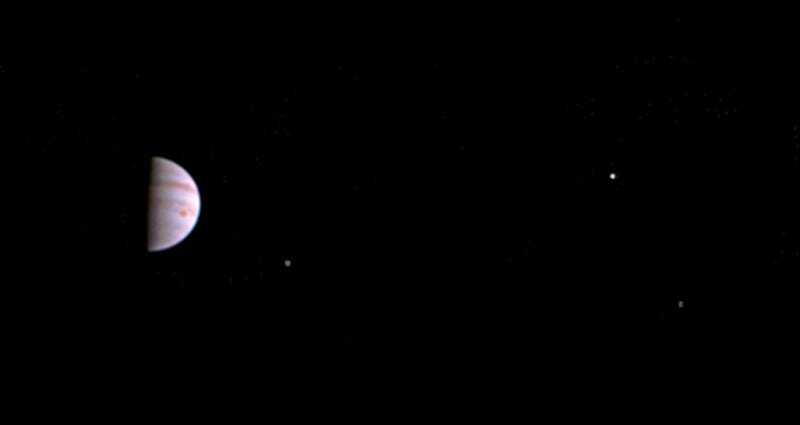 Earlier this month, Juno sent back a grainy image of Jupiter and its largest moons, but this is the first in-orbit image taken by the probe. This new photo was captured on July 10 when Juno was 2.7 million miles (4.3 million km) from Jupiter on the outbound leg of its initial 53-day capture orbit. The image may be low definition, but you can still make out atmospheric features—including the famous Great Red Spot—and three of Jupiter’s largest moons: Io, Europa, Ganymede (from left to right). NASA says the first high-resolution images will be taken on August 27 when Juno makes its next close pass to Jupiter. Indeed, it’s only going to get better from here. Eventually, the JunoCam will be used to take unprecedented pictures of Jupiter’s poles and cloud tops. Over the course of its mission, Juno will circle the gas giant 37 times, flying as close as 2,600 miles (4,100 km).